Since the early 1980’s Dr Hillary Egna has built a legacy of aquaculture research programs focused on helping small-holder aquaculture so it is with enormous pleasure that we honor Dr Egna as AwF’s Woman of the Month for September 2016. Hillary’s outstanding contribution to aquaculture began some 30 years ago after she was appointed Director of the Pond Dynamics/Aquaculture CRSP (PD/A CRSP), she began to apply for competitive research grants. The PD/A CRSP ended in 1987, yet coming from a background in private consulting in fisheries, Hillary took a chance and wrote a proposal making her the youngest and one of only two women to be lead Principal Investigator (PI) of a CRSP, a collaborative research program under USAID’s sponsorship. In the heavily male-dominated environment of ac ademia and aquaculture of the 1980s, she overcame challenges to establish a reputation for delivering innovative solutions. Through a series of independent grants and collaborations, Hillary has created an international aquaculture R&D center under which she provided organizational continuity. In addition to serving as PI on independent competitive grants for the PD/A CRSP, Aquaculture CRSP, AquaFish CRSP, and the current Innovation Lab, Hillary served as PI of a USAID multi-university integrated aquaculture project in Egypt (1992-95); a trainer on two Kuwait and Indonesia fisheries capacity building projects (1985-6); a consultant in salmon fisheries and aquaculture for Tribal Nations and US states (1983-1994); co-PI of a USAID Women in Development in Rwanda (1990-91); aquaculture specialist in Panama (1983); PI of a USDA China delegation in fisheries and aquaculture (2002); PI on a sustainable fisheries management project in Mali (2007-2011); and PI on a project for enhancing incomes of poor fish farmers using best management practices in Ghana, Kenya, and Tanzania (2010-2014). Unlike many organizations with core funding, Hillary’s organization relies entirely on entrepreneurial successes. She weaved together decades of overlapping aquaculture programs and projects to fulfill her vision by serving essentially one mission: a focus on the complex nexus of environmentally sustainable smallholder aquaculture. This focus has been Hillary’s passion, and she told us that she feels fortunate to have been able to follow a cohesive goal throughout her long career. Her work crosses into poverty and development issues as well as hunger and food security issues — in an effort to bring about human and environmental health along with fair and just opportunities for women and men. Through independent grants, she has had the unparalleled pleasure of collaborating closely with people from all corners of the earth, including students beginning their explorations of aquaculture, esteemed scientists who are giants in the field, policymakers making a difference in government, and with the many business people, producers and farmers that make a business of aquaculture. Hillary began her university studies at George Washington University in Washington DC before earning a BS in Natural Resources from the University of Michigan, a MAg in Aquaculture, and a PhD in Resource Geography from Oregon State University. As a very young girl of seven, Hillary became interested in feeding the world. Through a somewhat untraditional educational path, Hillary pursued university concentrations in engineering, marine biology, economics, and aquatic ecology, eventually to set her sights on the newly emerging field of aquaculture in the 1970s. While working as a zooplankton research assistant in 1980, she invented her own ‘zoop soup’ and tried it out on friends. Low on the food chain, nutritious, and tomato based, it failed to catch on. Realizing then that feeding the world was far more complex, she set out to learn as much as she could about development. Why do some people go to bed hungry? How can people thrive and live gracefully together on a shared planet? These ideals marked Hillary as a young woman, and still today, even with the wisdom that comes from experience, she maintains her optimism and ideals. As Chief Scientist and Director of the Feed the Future Collaborative Research Innovation Lab in Aquaculture & Fisheries since 2013, funded jointly by USAID and participating institutions, Hillary has led the Lab and its US and international partners including universities, research organizations, NGOs, and other groups to develop sustainable solutions in aquaculture and fisheries that conserve natural environments and improve food security and health around the world through multidisciplinary research, outreach, and training. Hillary’s legacy of three decades of linked programs has benefited the careers of hundreds of aquaculture professionals and institutions in 30 countries. Through her support, over 1600 students have received graduate and undergraduate degrees, and over 30,000 people have received short-term training. 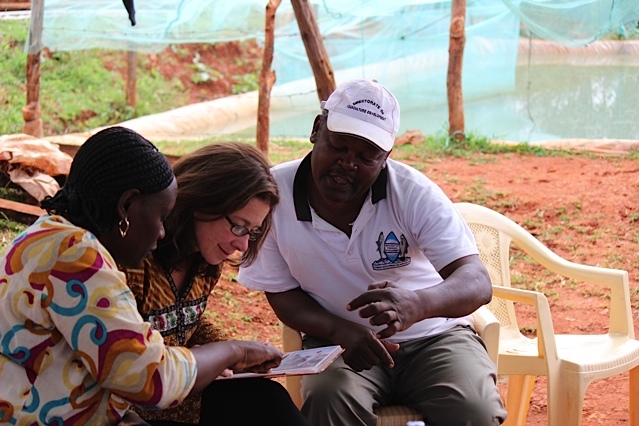 Through collaboration with her colleagues, Hillary has been instrumental in helping create aquaculture advanced degree programs at four universities — in Ghana, Kenya, Mexico, and Nepal — all of which are now training the next generation of aquaculturists through relevant experiential learning. 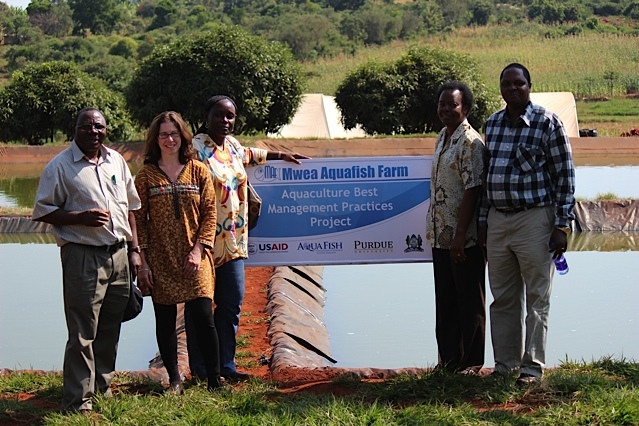 At OSU, Hillary has mentored many graduate and undergraduate students, and created graduate student fellowship programs to support women in international aquaculture and to encourage international dimensions of aquatic resources management. Teaming with Shanghai Ocean University in 2010, Hillary participated in designing the Yang Yi fellowship program for young scientists in aquaculture at the Asian Fisheries and Aquaculture Forum. Just like in her aquaculture organization, she strives for 50% participation each from women and men. Hillary advocates that women are essential to aquaculture sustainability, and has become well known worldwide for her dedication in this regard. Dr Egna has authored/co-authored over 200 general publications on topics including peer-reviewed papers on impact assessment methodology, gendered dimensions of disaster management in aquatic environments, remote sensing applications in aquaculture, network analysis in Rwanda, along with informal literature including newsletters, program reports, and trade articles. She co-authored with Claude Boyd the popular book, Dynamics of Pond Aquaculture (CRC Press, 1997), was executive producer of a DVD documentary on global pond aquaculture practices, Ponds for Life (2004), and participated in the production of podcasts and video stories as part of the CRSP team. Dr Egna received the 1997 Women in Leadership Award from the Northwest Chapter of the United Nations, UNIFEM. In 2012 she became the first woman recipient of The World Aquaculture Society’s (WAS) Honorary Life Award and in 2016 she received the gold medal award from the Asian Fisheries Society in recognition for her contributions to the field of aquaculture. Among her many accomplishments in the field of aquaculture as a research professor, Hillary has built a legacy of aquaculture research programs focused on helping small-holder aquaculture. These programs, from the Aquaculture CRSP in the 1980s to the current AquaFish Innovation Lab — were pieced together from independent competitive grants that eventually took the shape of an organization under Hillary’s leadership and vision. Beginning nearly 30 years ago, after she was appointed Director of the Pond Dynamics/Aquaculture CRSP (PD/A CRSP), she began to apply for competitive research grants. The PD/A CRSP ended in 1987, yet coming from a background in private consulting in fisheries, Hillary took a chance and wrote a proposal making her the youngest and one of only two women to be lead Principal Investigator (PI) of a CRSP, a collaborative research program under USAID’s sponsorship. In the heavily male-dominated environment of academia and aquaculture of the 1980s, she overcame challenges to establish a reputation for delivering innovative solutions. Through a series of independent grants and collaborations, Hillary has created an international aquaculture R&D center under which she provided organizational continuity. Currently Hillary is working with diverse teams on a variety of projects including solar engineering applications for pond aquaculture, on gender dimension of authorship in aquaculture journals, on climate change scenarios of air breathing fishes, and on recovery of a world-class global database of tropical pond data observations.